Here you will find some of the more common photography terminology, including specific digital photography terms. The aperture is the hole inside the lens that allows light through. Aperture is measured in "f" numbers - a ratio of the diameter of the hole and the focal length of the lens. The size of this hole can be adjusted – a larger hole allows more light in, a smaller hole less. An important effect of this is the depth of field. A smaller hole (higher "f" number) produces a lot of depth of field. The reverse happens with a larger hole (smaller "f" number). In digital photography, DSLRs can produce a range of depth of field effects. Compact digital cameras can't. This is due to the smaller sensors and shorter focal lengths used. The "Bayer" pattern is digital photography terminology to describe how photosites are arranged on an image sensor. A Bayer pattern has 50% green photosites, 25% red photosites and 25% blue photosites. There are twice as many green photosites than red or blue because human eyes are most sensitive to green light. Click here for more on the Bayer pattern. In digital photography terminology, blown highlights are areas of a photo that are so bright they are pure white. A digital camera can record 256 shades of brightness, from "0" (pure black) to "255" (pure white). Every pixel captured is assigned a brightness value. When it comes to editing, software can add to, or subtract from this value to make a photo brighter or darker. E.g. it can add "10" to every pixel to make the photo brighter. However, if a pixel already has the value of "255", it can go no higher. No detail can be found in these areas of a photo and they end up pure white. These areas are called blown highlights. Bokeh is a photography term that refers to the way a lens blurs an image. Generally it is considered good practice, especially with potrait photography, to have the main subject in focus and the background blurred. Bokeh refers to how evenly and pleasingly the out of focus (blurred) area looks. A popular type of memory card. Used in digital photography to store images. The amount of memory per card varies. Currently the majority of memory capacities freely available range from 4GB to 32GB. The larger capacity cards are really of use to professionals only. CF cards are the largest of the popular format memory cards. These days they are used mostly in larger digital cameras, rarely compact consumer cameras. Stands for Charge-Coupled Device. A type of sensor commonly found in consumer level (i.e. affordable!) cameras. See sensor for more information. Cross processing is an old film term. It refers to the practice of deliberately developing film in chemicals intended for a different type of film. For example, developing a slide film using print film chemicals. The result is un-natural colours and contrasts. In digital photography the effect can be achieved (and is easier to control) using software. In film photography photos are recorded onto light sensitive film. This is developed with special chemicals and a negative is produced. In digital photography photos are stored as a digital file. You need to decode the file in order to view it (see this section of the history of digital photography for more). There are different types of file formats used in digital photography. Some are lossy and some are lossless. The most common lossy file format used in digital photography is JPEG. The most common lossless file format used is TIFF. Increasingly becoming common are lossless RAW files. A type of sensor where the colour recording layers are stacked on top of each other. This means that every "pixel" can record the level of red, green and blue light hitting it. This differs from the bayer sensor, where each pixel can record only one colour of light. Click to learn more about foveon sensors. Film grain is not really digital photography terminology - the digital photography equivalent is noise. Film grain is the small speckles that show up on photographs. Film contains tiny granules of light sensitive material. The more sensitive the film is, the larger these granules are. When a film negative (especially from sensitive film) is enlarged onto photographic paper (in order to make a print), the tiny grains get enlarged too, and become visible. The effect of film grain is often considered to be artistic, and it is sometimes put back into digital images (using software) for artistic purposes. Not strictly speaking digital photography terminology, but a hot shoe is the special slot on the top of a camera that can accept camera accessories, usually a flashgun. They are uncommon on compact digital cameras and are usually found on digital SLRs (DSLRs). Unfortunately every manufacturer has their own design of hot shoe, so if you buy a flashgun for, say, a Canon DSLR; and then in the future go out and buy a Nikon DSLR your old 'Canon' flashgun won't work on your new Nikon camera. Image editing software is used to manipulate a photo once it has been taken. Digital cameras store images as files on memory cards. Once downloaded to a computer these files can be edited using image editing software. Editing can be used to improve a photo (for example, improving the contrast and then sharpening the image), or can be more extreme (for example, cutting a person out of one photo and pasting them into a different photo). Most digital photos can be improved by a little editing. Click to go to the image editing software home page. In digital photography terminology, JPEG is a type of lossy file format. Stands for Joint Photographic Experts Group. It is the most common file format used in digital photography. When the image is saved, the camera strips out data (parts of the photo) that the human eye probably won't notice. This is called "compressing" the file. It keeps the size of the file down so that more images can be stored on the camera's memory card. The level of compression is set by the photographer and will affect image quality. The more the image is compressed, the more data is thrown away (and a small file size is the result). Less compression = less data thrown away = larger file size. The danger is that if a file is compressed too much (i.e. lots of data is thrown away), the quality of the image suffers. The photos look "blocky" and "pixelated". On digital cameras the highest quality setting (usually called "Best" or "Fine") results in less data being lost, and a good quality image is produced. The lowest settings (usually called "Low" or "Economy") results in more data being lost, and a poor quality image is produced. Not specifically digital photography terminology, but still relevant to digital cameras, especially DSLRs. When using a DSLR it is possible to change the lens on the camera. The job of the lens is to throw a circle of focused light onto the image sensor. In the days of film cameras that meant the light fell onto the film. With digital photography the light hits the image sensor. Image sensors are usually smaller than a 35mm frame of film. This means the circle of focused light can be smaller too. Specific "digital only" lenses will throw a circle of focused light that will cover a digital camera's sensor, but is too small to cover a 35mm frame. They are therefore only suitable for use on digital cameras. When a digital camera takes a photo, the image data is stored on a memory card as a computer file. If the data is stored fully, the file is called a lossless file. These files are quite large in size. The most common type of lossless file in use are TIFFs. To cut down on large file sizes, the camera can throw away parts of the data that the human eye probably won't notice anyway. These files are called lossy. The most common type of lossy file are JPEGs. Caution should be taken when using JPEGs if image quality is important. NB: mp3 music files work in a similar way. The original, complete music file, is stripped down leaving only the bits that the human ear is sensitive to left behind. Read more about macro photography. Essential for digital photography! In digital photography terminology consider a memory card to be "digital film" - traditional cameras record photos onto film, digital cameras save photos onto a memory card. Memory cards come in different shapes and sizes. You need to use the correct memory card for your digital camera. The most popular formats are CF, Memory Stick, SD and xD. CF and SD are the most widely used. Consequently they are a little cheaper than the others. A memory card designed by Sony, and used almost exclusively in Sony digital cameras. There are different types of Memory Sticks – Standard, Pro, Duo, Duo-Pro, and Magic Gate. Confusing, isn't it! To make matters worse, they are not necessarily interchangeable. If you need to buy a memory stick for your digital camera check very carefully the type it uses. Sony Memory Sticks are now quite rare. Sony now uses more standard memory card formats, such as SD cards. When a digital camera captures an image it records two things in the file that is saved - image data itself, and data about that data (confusing, isn't it?). The "about the image" data is called "metadata". The information it contains varies from camera to camera, but typically includes, amongst other things, information such as date, time, shutter speed, aperture, ISO and file type. This information can be useful when trying to find photos later (because you can search for your images by date), and helps to improve digital photography because the photographer can work out what combinations of shutter speed and aperture work well. A small dot in a digital photography image. Thousands of pixels make up a digital photograph. In the days of film photography this referred to work done in the darkroom. Not simply developing the photos, but relating more to correcting colour casts, lifting dark areas of a scene, adjusting the contrast - that sort of thing. In digital photography terminology however, post processing means adjusting your digital photos using image editing software - Photoshop, for example. The same adjustments that were made in film can be reproduced with software. The opposite of a zoom lens, prime lenses have one fixed focal length. They represent the best quality of lens available, but have the big drawback in that they cannot 'zoom in' to a subject. In digital photography terminology, purple fringing is an undesirable purple "rim" that surrounds areas of high contrast in a digital image. It's very obvious when photographing people against a bright (but not deep blue) sky. The reasons for purple fringing aren't clear, although it is generally accepted that poor quality lenses and poor quality sensors make it worse. RAW files are the actual data taken directly from a digital camera's image sensor. They have not been processed by the camera at all. This means they are the purest image file possible in digital photography. Often, quite correctly, the terminology "digital negative" is used to describe them. Different camera manufacturers have different names for their own RAW files. For example, Canon uses the digital photography terminology "RAW", Nikon uses different digital photography terminology - "NEF". They are incompatible with each other. Whereas every computer can show JPEG images, RAW files need specific software. This is always supplied by the manufacturer when you purchase a digital camera. It is also easy to obtain on the internet too. In digital photography terminology, resolution is a measure of the number of pixels there are on a sensor. The resolution of digital cameras is measured in "megapixels" – millions of pixels. It works by a simple bit of maths – multiply the number of pixels along the bottom of the sensor by those up the side. For example, a sensor with 3000 pixels along the bottom, and 2000 up the side equals 6,000,000 pixels in total. That would make it a 6 megapixel camera. Click for more about resolution. A popular type of memory card. Used in digital photography to store images. The amount of memory per card varies. Popular memory capacities these days range from 2GB to 32GB. Some SD cards have a clever feature where part of the card can flip up; this allows the card to be inserted into a USB port on a computer – images can be transferred to the computer without the need for a card reader or any special cables. There are other types, but not well used. JFET (Junction Field Effect Transistor) – developed by Nikon and used in a very small number of their cameras. X3– a new type of sensor developed by Foveon. Used only in Sigma DSLRs and a couple of Polaroid compact cameras. Stands for Single Lens Reflex. A design of camera where the photographer looks straight through the lens prior to taking a photograph. The view through the viewfinder of a SLR camera is therefore the exact same image that will be recorded by the camera. A way of producing 3D images from 2D photography. Not strictly digital photography terminology, although the effect is easier to achieve in digital photography than in film photography. Two photos are taken at the same time, by two separate cameras that are set a short distance apart. The resulting images are then swapped (i.e. the photo taken by the left-hand camera is placed to the right-hand side of the other image) before viewing. Viewing takes practice and involves crossing the eyes and merging the two photos. Click for more on stereoscopic 3D photography. In digital photography terminology a TIFF is a type of lossless file format. Stands for Tagged Image File Format. Because they are lossless files the image data is stored whole (nothing is thrown away*). This results in large file sizes, but also good quality photographs. * TIFFs can be compressed to save space, but not as much as JPEGs. When they are un-compressed the software reverses the original compression process; the original large file is the result. In photography, a vignette is when the edges of an image are either darkened, or lightened, in relation to the rest of the photo. It has the effect of drawing the viewer "into" the photo. The vignette can be caused accidentally by obstructions (for example, the lens hood) creeping into the frame at the edges. Or, as is more common in the digital age, a vignette is applied to an image after the photo has been taken using software. Here's where you can find a photoshop tutorial on creating and artistic vignette. A small memory card (smaller than SD cards) introduced by Fuji and Olympus. They are designed specifically for digital photography (other memory cards were designed simply as data storage devices). They are not as widely used as either CF or SD cards. 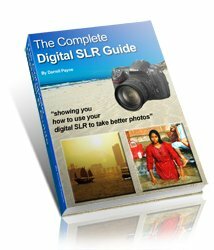 If you have read enough on digital photography terminology, explore the rest of this site!